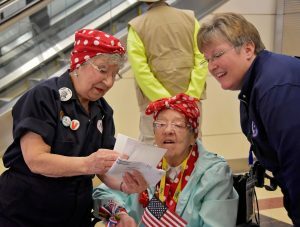 Tuesday marked the first-ever official National Rosie the Riveter Day, celebrating the many women who entered the workforce during World War II. More than seven decades after the end of the war, Congress approved a resolution recognizing the 16 million women who worked at a time when production couldn’t meet demand. This meant women entering the workplace to help build ships and airplanes for the war effort. Women were also initially rejected for some of these jobs, which were opened up to them when men were called to war. On Tuesday, six “Rosies” were honored at the Rosie the Riveter WWII Home Front National Historical Park in Richmond, California, for their contributions during the war. Among them was Marian Sousa, 91, once a “draftsman” who drew blueprints for warships who now lives in El Sobrante, California. “Well it’s about time,” she told Reuters. Rosie the Riveter is known as a cultural icon that encouraged women to join the workforce during wartime. But the name is often associated with the 1942 “We Can Do It!” poster created by J. Howard Miller for the Westinghouse Electric & Manufacturing Company. The poster was designed to incentivize work overall and not necessarily women, as The Atlantic pointed out. Work conditions were so dangerous that between the 1941 bombing of Pearl Harbor and D-Day invasion of Europe in 1944, there were more industrial casualties than military casualties, according to the National Park Service. National Rose the Riveter Day takes place during Women’s History Month, which honors American women’s contribution to U.S. history. The national celebration, which was originally relegated to a week in 1982, was expanded to a full-month observation five years later. A second event honoring the Rosies is scheduled for April 8 in El Cerrito, California.